This article is excerpted from an original article in the Fish site that can be found here. Concrete pilings support oysters better than other materials. US - Filter-feeding organisms such as oysters, mussels and barnacles improve water quality, with large colonies filtering vast amounts of water every day. These natural habitats are often destroyed by manmade structures on shorelines because dock owners may use materials that actively discourage oyster colonization for aesthetic reasons. Researchers in the US have now quantified this effect for the first time and are calling for incentives for residents to use materials that encourage these filter-feeding organisms to colonize. Craig Layman, then at Florida International University, US, and his colleagues looked at oyster populations in the Loxahatchee River and estuary, on the southeast Atlantic coast of Florida. Manmade development has greatly disturbed shoreline habitats here, but the river still supports ~60,000 sq. m of natural subtidal oyster reefs as well as an additional 24,000 sq. m of oyster restoration reefs that were constructed in the river in 2010. “We found that filter-feeding organisms that colonized dock pilings have about 30 per cent of the filtration capacity of the entire 60,000 sq. m of natural reef habitat,” Layman told environmentalresearchweb. Layman believes that by encouraging dock owners to use more oyster-friendly materials, this figure could be increased even further. The study found that concrete pilings supported 68 per cent of total filtration, despite accounting for only seven per cent of all pilings. Other pilings are made from wood, PVC pipe filled with concrete or wood wrapped in a high-density polyethylene material (pile wrap). 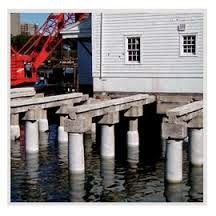 Pile wrap was the most common dock piling type, making up 69 per cent of the river’s dock pilings, yet these pilings supported only 10% of all filtration. “Introducing a tax credit for concrete pilings, which are the most expensive type of piling but the most oyster-friendly, would encourage home owners to use this material,” said Layman.